Adult Couple Annual Fishing Pass Fish Today! Child Annual Fishing Pass Fish Today! 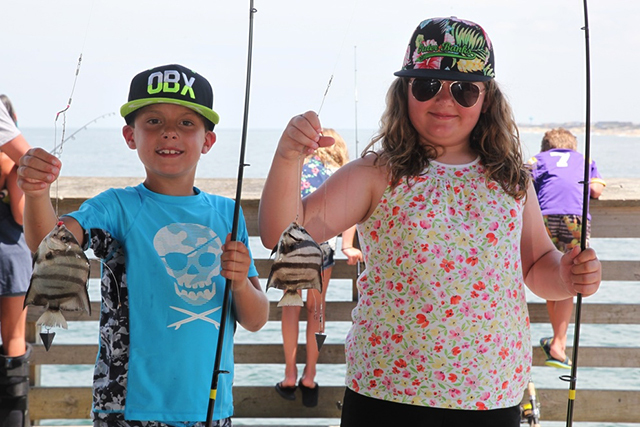 Jennette’s Pier in Nags Head is the ultimate location for a distinctive event on the Outer Banks of N.C.
Our version of Fishing 101 offered Monday -Friday all summer at 9 a.m.
Connect your business with all the great things the Aquariums and Jennette’s Pier have to offer! Business Members are annual donors whose support is used directly to help the Aquariums and their exhibits, programs, and conservation efforts. All three Business Member categories offer great benefits to business owners and their employees. Aquarium Family Membership is included with your fishing pass! 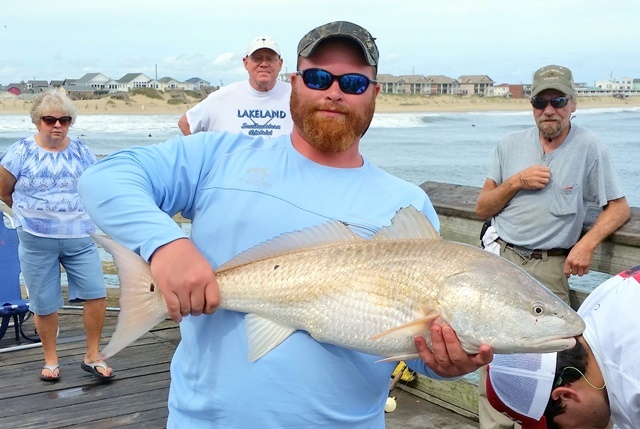 FREE unlimited fishing on Jennette’s Pier (Pin-Rig Fishing Not Included). 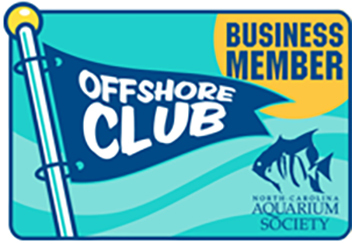 Members receive unlimited free admission for one year at all three North Carolina Aquariums. Memberships receive free admission for two adults named on the card and their children or grandchildren under the age of 18. The North Carolina Aquariums and the Association of Zoos and Aquariums (AZA) have partnered to provide discounted admission to Aquarium Society members at over 150 zoos and aquariums around the country. For NC Aquarium members, this means discounted admission at the NC Zoo! Unless otherwise stated, discounted admission is limited to two adults and two children under the age of 18 (for Family and Curator memberships). Reciprocity agreements are subject to change, so we advise you to contact facilities prior to your visits. To see a complete listing of all reciprocal facilities, click here. Members receive a 10% discount on gift shop purchases at the three Aquariums and Jennette’s Pier. (Sale Items excluded). Don’t forget to stop by the gift shops on your next visit to the North Carolina Aquariums. Receive a 10% discount on Aquarium educational programs, camps, classes, and field trips offered throughout the year. Members also get early notification of many Aquarium activities through SEAmail, our monthly e-newsletter. Be sure to have your member card ready when you sign up! All active Aquarium members can treat their guests to a 10% discount off regular admission rates. This benefit is limited to six guests per visit. Guests must arrive with members at the Admissions window, and the discounted admission may be paid by the member or by their guests. This guest discount is not available through online ticketing. Receive discounts on food and merchandise purchases at the pier. 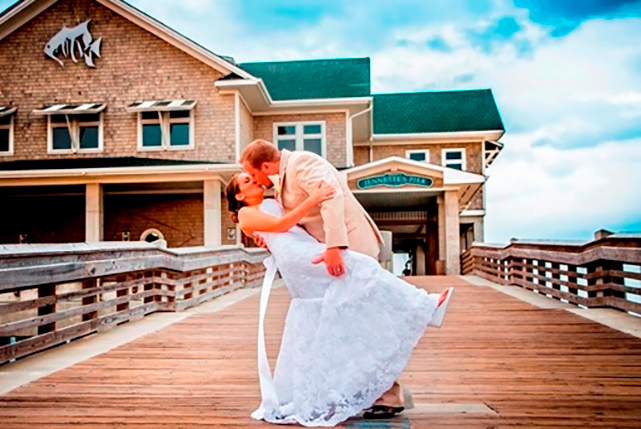 Foto FX is the Aquariums’ official photography provider. Members receive a free print with the purchase of any photo package. Get your costumes ready, and don’t miss the spook-tacular TOTUS events at the Aquariums, coming up in October! Members receive a reduced admission rate for these popular events, where the Aquariums are transformed into underwater haunted houses. Check our programs and events page or contact your favorite Aquarium for more details. Membership includes two membership cards. If you would like additional cards or lose your card and need a replacement, they can be purchased for $5 each. When your membership is due for renewal, we’ll send you an email reminder. Just open the email, click on the link for online renewal, and complete your transaction safely and securely. Be sure to add us to your contacts list to make sure you’ll receive our emails. Prefer to renew offline? We’ll be happy to renew your membership by phone, mail, or during your visit the one of our Aquarium locations. *Sales tax is included in the total membership cost. Aquarium Membership discount for employees is 25% for all three levels. Your membership dues are tax deductible as allowed by law. For more information, contact your tax advisor. Sales tax is included in the total membership cost.